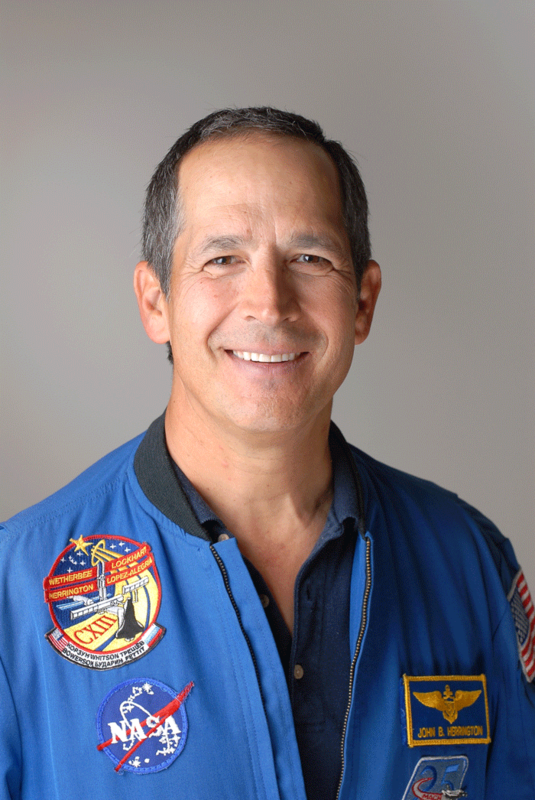 PHOENIX – Chickasaw astronaut John Herrington is among 12 individuals inducted into the inaugural class of the National Native American Hall of Fame. Induction ceremonies were Oct. 13 in Phoenix. Herrington, who was born in Wetumka, Oklahoma, is one of seven inductees from Oklahoma. Herrington, the first enrolled citizen of a Native American Nation to fly into space, made a comparison between the induction ceremony and a 40th-anniversary celebration of the Apollo 10 mission. Apollo Astronaut and Oklahoman General Thomas Stafford invited Dr. Herrington to the celebration as a fellow Oklahoman. Governor Bill Anoatubby said that Herrington is a great role model. That goal was inspired by his maternal grandfather, Cub Owens. Herrington singled out his mother Joyce, and her father when asked about his childhood Native American role models. Since retiring from NASA Oct. 1, 2005, Herrington has focused on encouraging Native American students to pursue an education in science, technology, engineering and mathematics (STEM). In 2008, his passion for promoting STEM education led him to ride a bicycle more than 4,000 miles across the United States to personally encourage young Native American students. After years of promoting education, Dr. Ed Galindo, a Native American instructor he met in Idaho during his bike ride inspired Herrington to continue his own. In 2014, Herrington earned a doctorate in education from the University of Idaho. Dr. Galindo worked with Herrington to focus his research. He noted that while there were numerous studies looking at the reasons Native American students were not successful in education, few looked at the reasons for success, even though there are quite a few successful Native American engineers and scientists. Herrington interviewed numerous successful Native students in STEM programs in Idaho to find why they were able to succeed. Herrington, a board member of the American Indian Science and Engineering Society, said increased membership in that organization is a good sign. In 2015, he joined the first lady Michelle Obama, Secretary of Interior Sally Jewell, Secretary of Health and Human Services Sylvia Burwell, U.S. Attorney General Loretta Lynch and other high-level officials scheduled to speak at the first-ever White House Tribal Youth Gathering. Part of President Barak Obama’s Generation Indigenous (Gen-I) initiative, the event was designed to provide American Indian and Alaska Native youth from across the country the opportunity to interact with senior Administration officials and the White House Council on Native American Affairs. “The fact that this gathering is on a national stage and is supported at the highest level of our government, should give the students a strong indication that their thoughts and aspirations matter,” Herrington said at the time. “Regardless of the venue, my message to students is for them to believe they are capable of accomplishing great things in life. I believe the steeper the climb, the more satisfying the view from the top. Today, he continues that work of motivating Indian students and explaining how to help them become successful. Other members of the inaugural class of the Native American Hall of Fame from Oklahoma are: Jim Thorpe, Sac and Fox; Wilma Mankiller, Cherokee; Maria Tallchief, Osage; Allan Houser, Apache; N. Scott Momaday, Kiowa and LaDonna Harris, Comanche. Other members of the inaugural class are Elouise Cobell, Blackfeet from Montana; Lori Piestewa, Hopi from Arizona; Billy Mills, Oglala Dakota from South Dakota; Vine Deloria, Standing Rock Sioux from South Dakota and Lionel Bordeaux, Sicangu Lakota from South Dakota. More information is available at www.nativehalloffame.org/.